Chickering & Sons Piano Co.–Rochester, New York. 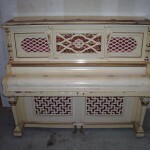 This console piano has an incredibly ornate Art case with alot of potential. It’s in process of being stripped and refinished to a satin black. The action and keytops are in good condition. Sound is full and bright. $1,700.